Conferences & Accommodation at UBC’s Okanagan campus recognizes that we have local as well as international environmental impact, and are not just another Kelowna hotel. UBCO is committed to complying with all local, provincial and national environmental legislation, and our goal is to successfully implement environmental “best practices” in our conference venues, accommodations, operations and activities. To learn more about UBC’s green initiatives, visit the UBC Sustainability Office website. please pick-up the Sustainability Walking Tour brochure at the front desk. 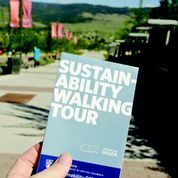 Please contact the Sustainability Office to request a tour.